The variations in the concentration of polychlorinated biphenyls (PCBs) and organochlorine pesticides (OCPs) in atmospheric air in the northern Lake Hovsgol region in 2008–2015 is analyzed using passive air sampling data. It was found that the concentrations vary from background values (comparable with those for other high-mountain regions) to the levels typical of large settlements. The quantitative and qualitative variations in the concentration of PCBs and OCPs in air are recorded. The variations characterize the influence of both natural (seasonal variations in temperature and average annual temperature anomalies over the land and sea across the globe and Northern Hemisphere) and anthropogenic factors. There is a trend towards the increase in hexachlorobenzene (HCB) levels and the decrease in hexachlorocyclohexane (HCH) and dichlorodiphenyltrichloroethane (DDT) levels in the atmosphere. No significant variation in the total PCB was found in 2011–2015. The results of the modeling of PCB and OCP fluxes in the air-soil system in the analyzed region demonstrate that deposition prevails over volatilization that corroborates the significance of atmospheric transport for the PCB and OCP inflow to the Lake Hovsgol region. Russian Text © E.A. Mamontova, E.N. Tarasova, A.A. Mamontov, A.V. Goreglyad, L.L. 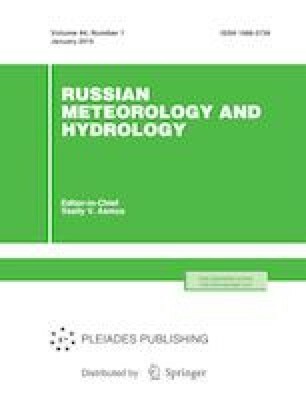 Tkachenko, 2019, published in Meteorologiya i Gidrologiya, 2019, No. 1, pp. 113–123.